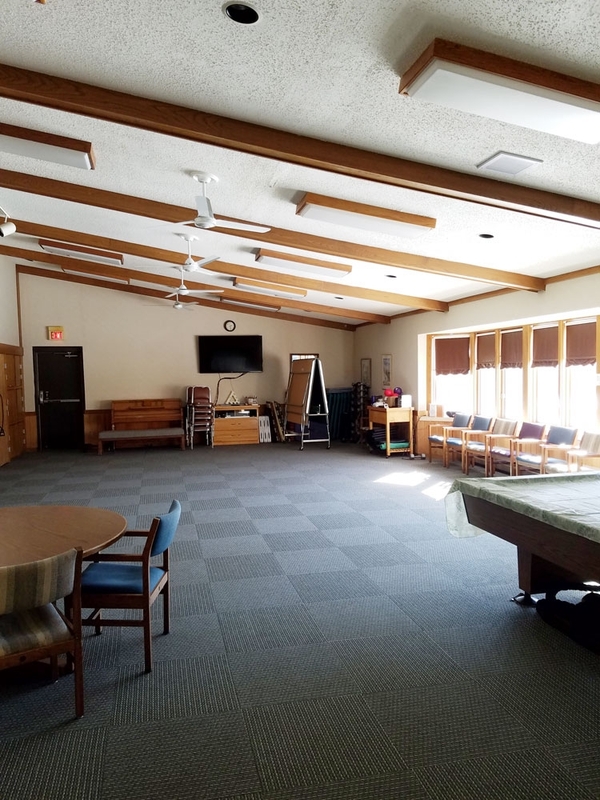 Inside this building you will find a marvelous 60' long pool and hot tub, workout room, large conference room with TV, pool and ping pong tables, bathrooms and showers, games, books, and vending machines. Daily Open and Lap Swim: Please check out our hours to see what time fits your schedule. We offer two lap swim times and three open swim times. Weight Room: Our weight room is small but mighty. We have three brand new treadmills, an elliptical, NuStep, recumbent bike, stationary bike and some very nice weight lifting equipment plus free weights. We also have exercise balls that can be used in the Mosling Room along with mats for doing some stretching. Mosling Room: Our multi-purpose room is used for all sorts of events. For a fee this room can be rented out for birthday parties or other gatherings. NWTC classes are held in this room along with teen night. This room has a big screen tv, billiards table, ping-pong table, and WII system.